Can Sesame Seeds Help You Lose Weight? Adding a few sesame seeds to your food isn't going to cause any extra pounds you are carrying to disappear. Sesame seeds do contain a number of substances that may make it easier for you to stick to your daily calorie allotment and lose weight, however, including protein and lignans. Of the macronutrients, protein tends to be the most filling. This makes it a good idea to include at least some protein in every meal and snack when you're trying to lose weight. Registered dietitian Christine Gerbstadt noted in an article on fitnessmagazine.com that protein may also increase your metabolic rate. This could make it easier to lose weight. A weight-loss diet high in protein may help you lose more fat while maintaining your muscle, especially if you combine it with cardiovascular and strength-training exercises, according to a study published in "The Journal of Nutrition" in August 2005. Gerbstadt also notes that chemicals called lignans that are found in some plants, including sesame seeds, may help you burn more fat because they cause your body to release more fat-burning liver enzymes. An article published in "Recent Patents on Food, Nutrition & Agriculture" in January 2011 notes that sesame seeds contain about 2.5 percent of these lignans, which may inhibit the formation and absorption of cholesterol and decrease fat metabolism. Each pound of weight loss requires you to create a 3,500-calorie deficit by either eating fewer calories or exercising more. 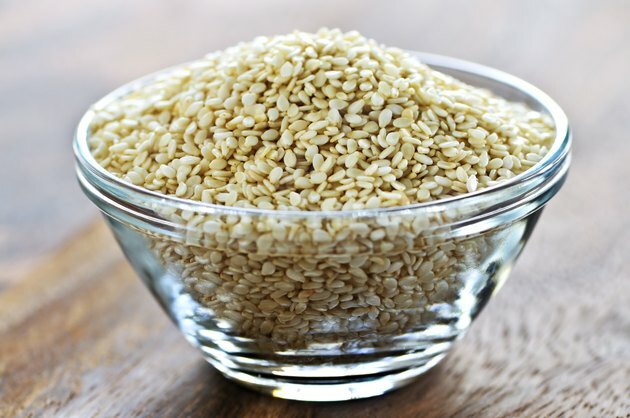 A tablespoon of sesame seeds contains 52 calories, and an ounce of these little seeds has 158 calories. If you want to lose weight, you can't just add sesame seeds to your diet; you have to eat them in place of another, less healthy high-calorie food. You can trade peanut butter for sesame seed butter, add the ground sesame seed paste called tahini to sauces or sprinkle sesame seeds on salads. Sesame seeds pair well with chicken or salmon and make a delicious addition to homemade granola. You can also use them to add crunch to the top of baked goods. Are Protein Bars Safe to Eat During Pregnancy?